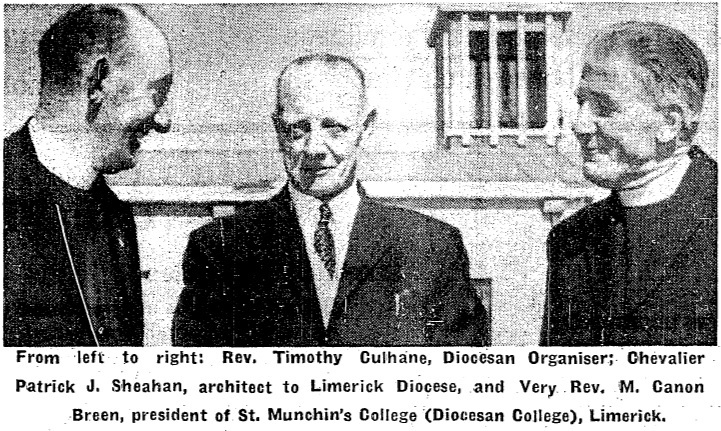 The following audio possibly accompanied a video reel of the official opening of St Munchin’s College, Corbally, Limerick on August 28, 1963. Recorded by Fr. Denis Browne, Digitised by Mike Mulcahy for John Upton. The foundation stone for the building was laid in April 1960 and on completion it had room for 350 pupils. The college was designed by Mr P. J. Sheehan and erected by Messrs. P.J. McGuinness and Co. builders, Dublin. Among the almost 300 guests at the opening day were President Eamon de Valera, Mayor of Limerick, Frances Condell and the Bishop of Limerick Most Rev Dr Murphy. Others important members of the Catholic Church in attendance included the Bishop of Cork and Ross, Most Rev. Dr. Lucey; the Bishop of Kerry, Most Rev Dr Moynihan; the Bishop of Galway, Most Rev Dr. Browne; the Bishop of Killaloe, Most Rev. Dr J Rodgers; the Bishop of Cloyne, Most Rev Dr. Aherne; Auxiliary Bishop of Honolulu, Most Rev. Dr. Scanlan; Right Rev. Dom Dowdell. Lord Abbot of Glenstal; Right Rev Monsignor Moloney, St Munchin’s. Right Rev Monsignor Healy, California; Right Rev Monsignor G. Mitchell, President Maynooth College; Right Rev Monsignor J. O’Keefe, Los Angeles; Right Rev Monsignor P. Collins; Right Rev Monsignor J. Brown, Salford; Right Rev Monsignor M Meehan, St Petersburgh, Florida; Venerable Archdeacon W.J. Carroll, P.P. Rathkeale. Image: Irish Independent, August 29, 1963. Here you can read the St Munchin’s College school magazine The Torch.